Tropical plant, native to the Indomalaya regions, belonging to the family of Poaceae. Sugar cane was born naturally in New Guinea, where it grows spontaneously even today. It gradually spread to Asia Minor where it was discovered by Alexander The Great in 325 BC. The first news of the arrival on the shores of the Mediterranean are described by Pliny The Elder, who mentions it as saccharum, sarkara from Sanskrit. The arabs introduced it to Spain and with the discovery of the New World it showed its great development. The cultivated variety, Saccharum officinarum, grows in tropical climates with a cycle of 14-16 months. It looks like a big bamboo with flowers gathered in a large terminal panicle, has underground rhizomes from which start more cylindrical stems, gnarled and flexible that can be high till 3-6m with a diameter of 2-7cm, the leaves are very long, linear, and rugged. The planting of sugar cane is made by cutting. The plant grows in height and foliage up to 12 months. Like all green plants, through photosynthesis, it produces sugars, which serve as an energy source for various metabolic processes, accumulating them in the trunk. The cane is cut in the section closest to the ground and then reduced by the top. The part remaining into the ground will reproduce new canes within three months. 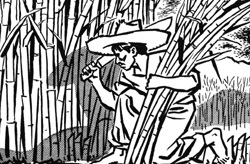 The stalk of the cane contains 14% woody material, 70% water, 14% sucrose and 2% of impurities. Within a few hours the plant should be sent to milling in order to prevent drying out and losing most of the juice.